At Crane Garden Buildings, we strive to be responsive to our customers' needs. 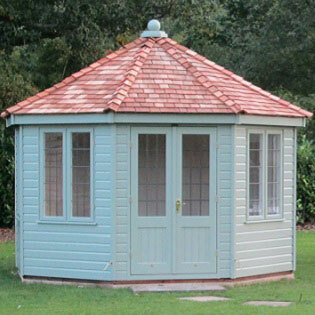 That's why when we're asked by hobby enthusiasts which Garden Shed to recommend, we tell them we can tailor all of our Garden Buildings to their unique requirements. However, when it comes to model railway enthusiasts, our Superior Sheds remain a popular choice. 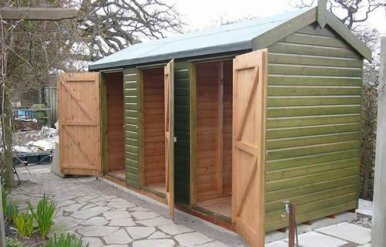 This is because although all of our garden sheds are robust and long-lasting, our Superior Sheds offer a heavier duty construction. On the right is a great example of one of them in action for a customer. Most garden buildings do not require planning permission, but if you have any concerns please read our Planning Permission for Garden Buildings article. You can check online with our Planning Permission Calculator. 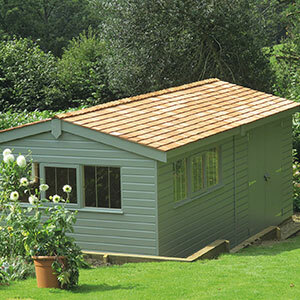 Every one of our garden buildings are finished in tongue and groove cladding, available in either our standard planed shiplap or sawn weatherboard, which offers a more rustic finish. 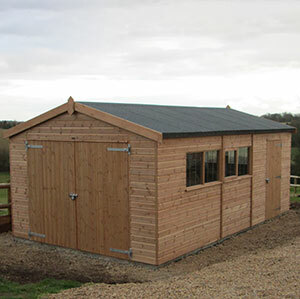 Our expert team hand-craft all of our timber garden buildings, so we can offer you the opportunity to customise it to your exact requirements. Our Online Garden Building Planner Tool will take you step by step through each stage and will provide you with an immediate quote which you can amend as often as you wish. 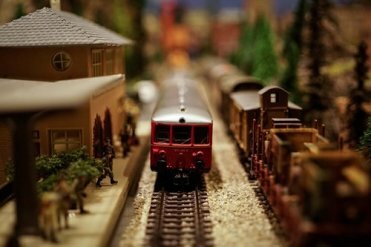 We know that it its easy to wile away countless hours building and perfecting the ultimate railway model. We want to make sure you are aware of what we can do for you. So, we have put together a list of the most popular additions opted for by model railway enthusiasts when designing their sheds. With model railway enthusiasts investing hundreds, if not thousands of pounds in their past-time, security is sure to be at the top of your priorities. 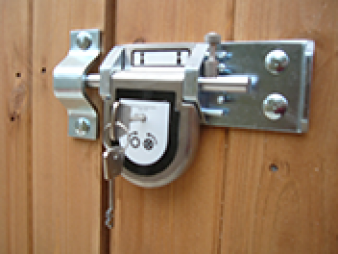 We offer a security pack which features steel bars mortised into the window frames during construction, a 7-lever anti-pick, anti-crop lock and anti-tamper screws and hinges, which is sure to keep thieves at bay. This can be selected as an option in our online garden building planner tool. Many people like to work on their model railway project all year round, and without the right insulation sheds can be cold places in the winter! With electrics, rails and scenery being sensitive to heat and moisture, insulation can help to reduce extremes of temperature throughout the seasons. 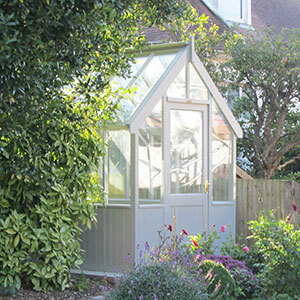 Find out more about how we insulate our garden buildings in our related article, Focus on Insulated Garden Buildings. 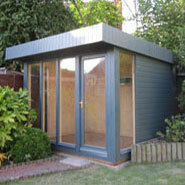 Our garden buildings are a quality investment, and so we want to ensure any costs of upkeep are kept to a minimum. Therefore, we make sure all our flooring is of the highest quality and strength. We also provide our customers an increased heavy duty option. Our standard flooring is ex 19mm in thickness and our heavy duty option is double that, at ex 38mm. If you anticipate frequent use or use for extended periods of time, we recommend opting for heavy duty flooring. Arguably one of the most important aspect of any good model railway sheds is sufficient electrical access. We offer a professionally installed electrical pack which includes a number of double 13 amp sockets, light switches and ceiling lights. An optional heater can also be included. Electrical packs should be included at the time of construction and unfortunately, cannot be retrospectively fitted to buildings. A partition wall creates the option for a multi-use space, allowing for separate storage or configuration options. This means you can have a place to store your garden furniture or wood without it interfering with your model railway plans. A number of customers opt for our 900mm high x 600mm wide oak-faced plywood workbench to be installed at the time of build. This could be a useful platform to keep any tools you may need when practising your hobby. Every one of our buildings is finished in our standard light oak preservative, but we offer a range of optional long lasting Exterior Paint Options. These are specially selected for their durability, which reduces the frequency of the ongoing maintenance you will need to complete. Our colours complement all styles of garden, and also help protect the exterior from fungi and woodworm. We deliver and install all our buildings as part of our inclusive end to end service. This ensures they are perfect from day one. Our team are skilled and efficient and therefore usually only take a few hours to complete a standard installation. If you want to get first hand advice from an expert member of the team, why not book a visit to one of our Seven UK Show Centres? 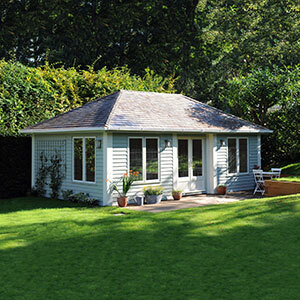 This would also give you the chance to see our full collection of garden buildings. Alternatively, if you have any queries you can Request a Callback, Contact Us, or call a member of the team directly on 01760 444 229. We hope this planning advice has been helpful to you.